Jerome Reuter is part of a long tradition of lonesome guitar heroes, outcasts moving about restlessly, pursued by their dreams and demons, dedicated to a life beyond the pale. Jacques Brel, Johnny Cash, Townes Van Zandt, Tom Waits, Leonard Cohen, Michael Gira, Nick Cave – architects of melancholy like these have left their footprints in Jerome Reuter’s artistic expression. His music unites American folklore with Chanson and the angst-ridden tristesse of English Post Punk – ‘Chanson Noir’, as he once called it. Looming above all this is his distinctive, deep voice. A voice you want to believe knows all about man’s true nature and purpose. The lyrics to his concept albums (in which a single song despite its catchy tune always remains but a fragment of discourse rather than an analysis of historical reality) may be inspired by the works of William S. Burroughs or Bertolt Brecht, may dive into the literary oceans of Paul Bowles or Jack London, may be odes of love set against the backdrop of social and cultural conflict; what they always are, however, are honest expressions of freedom. The protagonists of ROME’s lyrical world are history’s forgotten heroes and outsiders, most notably of the 20th century: Anarchist rebels (as on “Flowers From Exile”, 2009), the French resistance (“Nos Chants Perdus”, 2010), Southern Africa’s struggle for freedom (“A Passage To Rhodesia, 2014) or revolutionaries and underground fighters such as those on ROME’s ambitious trilogy “Die Aesthetik Der Herrschaftsfreiheit” (2011) inspired by the works of Peter Weiss and Pablo Neruda among others. ROME’s central characters are gracefully sacrificing everything for love and ideals while taciturnly facing the turmoil life is throwing at them. Deep at the bottom of Jerome Reuter’s work, however, lies the idea of the entente cordiale. Seeking to unearth the hidden passages between the nations. Hence the ambitious concept works, hence the multilingual lyrics and the relentless touring from Jerusalem to Saigon. “Bewegung entsteht durch Haltung” – this slogan, which loosely translates to “movement stems from composure”, is found on the very first release, the “Berlin” EP, and remains valid to this day. Jerome Reuter himself is the epitome of the particular brand of steadfast restlessness expressed in it. ROME knows no cheap thrills or shock tactics. True to his artistic vision, a heralder of melancholy, of elegiac hymns bearing the verve of protest songs, he travels the world, presenting his songs with fervor, pureness and deep empathy. 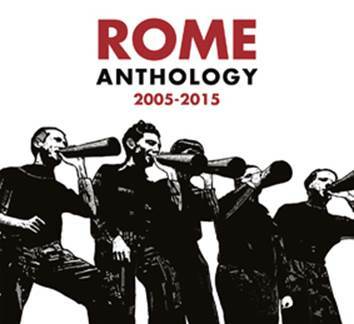 To celebrate the 10th anniversary of his project, ROME has not only embarked on an extensive tour with concerts in Tel Aviv, Berlin, Athens, Los Angeles, Moscow, Kiev, Rome, Madrid, London, Vienna, Zurich, Brussels, Cologne, Stockholm, Bucharest, Prague and numerous other cities, but is also releasing a concise retrospective entitled “Anthology (2005-2015)”. This selection features some of the most important works of ROME, songs of haunting beauty, moving through the hinterlands of fact and myth, and speaking of the greater context as well as from the heart. And as the ongoing tour has been showing, ROME just like Cash, Cave or Cohen before him, unites a diverse audience, of various generations, cultural and social backgrounds. This is then what true art comes down to. A man with his guitar. An otherwise empty stage… And so it begins anew.